Isn’t this photo worthy of a post? Maybe a “caption this” for a prize? Here’s the prize: your choice of one Bob’s Red Mill product. I’ll pick up a case of it from the Bob’s Red Mill store and either deliver it the next time I see you, or mail it to you (in case the winner is in Bogota or something). Maybe should be Tom instead of Charlie though. Does Kris work at the State of Oregon Forensics Center in Clackamas? It looks familiar, I put the automatic doors in the autopsy area! Small world. [Editorial addition to fix sidebar] Now, there’s another: Roswell, Texas. Annie Oakley, eat your heart out! This picture is fantastic and I’d love to vie for a case of Bob’s. However, I can’t think of anything. I’ll settle for voting for Mike’s caption. 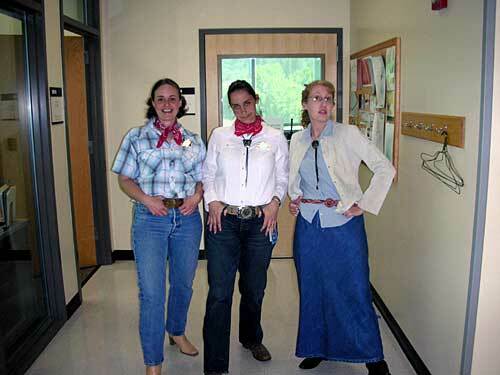 The FFC (Fabulous Forensic Cowgirlz) take a break for a photo shoot before heading back to work at their spectrometers. I’m going to enter my own contest. These three trying to look onry – Priceless!